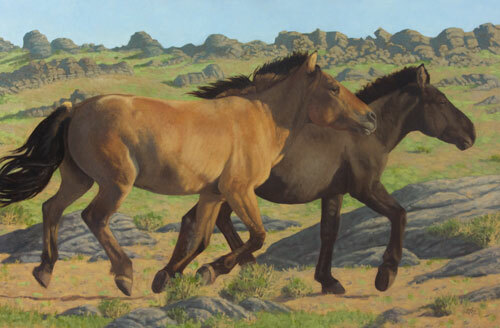 I’m proud to announce that “Mongol Horse #5-Evening Run” has been accepted into the Society of Animal Artists 51st Annual Exhibition of “Art and the Animal”. The subjects are part of a herd of horses which wandered past the Red Rocks ger camp at Ikh Nartiin Chuluu Nature Reserve when my husband and I were staying there in 2008. Currently I’m down on the Delaware Coast. My artist friends, Guy Combes and Andrew Denman, and I are planning to spend tomorrow exploring Assateague and, if we have time, Chincoteague islands.